In a successful bioeconomy, diverse stakeholders will need to come together in support of budding renewable energy industries. In November 2014, landowners, policy makers, students, and Extension professionals gathered to watch the first harvest of poplar trees at the Advanced Hardwood Biofuels Northwest (AHB) demonstration sites in California and Washington to learn more about this emerging bioenergy crop. A huge Case New Holland (CNH) forage harvester with a modified header cut and chipped the poplar trees at the two sites. 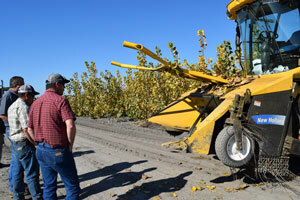 This farming equipment, built specifically for poplars and willows, cuts and collects the poplar chips in a single pass. 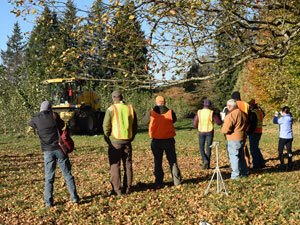 Harvest spectators at the Pilchuck Demonstration Site. In Clarksburg, California, Carmen Spranger, Air Pollution Specialist, from the California Air Resources Board wanted details about how AHB is working to make the production of poplar trees for bioenergy sustainable. “As we move forward with our sustainability provisions for the Low Carbon Fuels Standard, gaining as much information as possible about the work on the ground will help out a lot,” said Spranger. Experimenting with new crops and agriculture techniques is important to the Kirtlan family who lease land in Clarksburg to GreenWood Resources for the AHB project. The family has farmed the Sacramento River Delta since 1849. “Green energy is something new for everybody, and a lot of the farms throughout the U.S. really need to start looking at this,” said Bobby Kirtlan, a sixth generation farmer who also oversees the irrigation of the poplar trees at the Clarksburg demonstration site. Bobby Kirtlan checks out the harvester with neighboring landowners. The initial harvest at the Clarksburg and Pilchuck demonstration sites sets the stage for potential robust regrowth from the mature rootstock over the next three growing seasons. At that time, the poplars will be harvested again with yields anticipated to be up to five times more that the initial harvest.